It took me 55 battles to get my 15 top-10 missions done. I have to say, it's not my favourite tank. As a credit maker, I found it rather poor, as much of the time I found myself loading gold, and still not penning simple things like the mini turrets on the O-ho. However, despite a few battles where it was unable to pen or to bounce incoming shots, there were quite a few others where everything came together well and I got a first class, as in these examples. 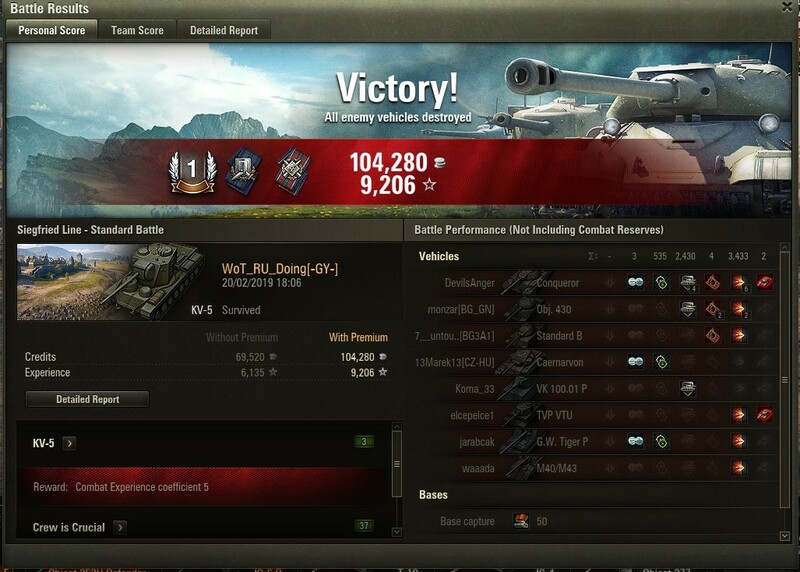 I soon learnt that a spall liner is a good item for the KV-5, as it's an absolute arty magnet. However it's rather hard to decide what role the tank fits best in. The long distance accuracy is superb, and the gun is also great if you can flank the enemy tanks. So in some ways this works as a TD or Heavy medium. On the other hand, I had some battles where it did just fine either shot trading or brawling, but the weakspots can be a problem. Obviously, these issues are less significant when you are top tier, but until the revised matchmaker comes in, that won't happen very often. 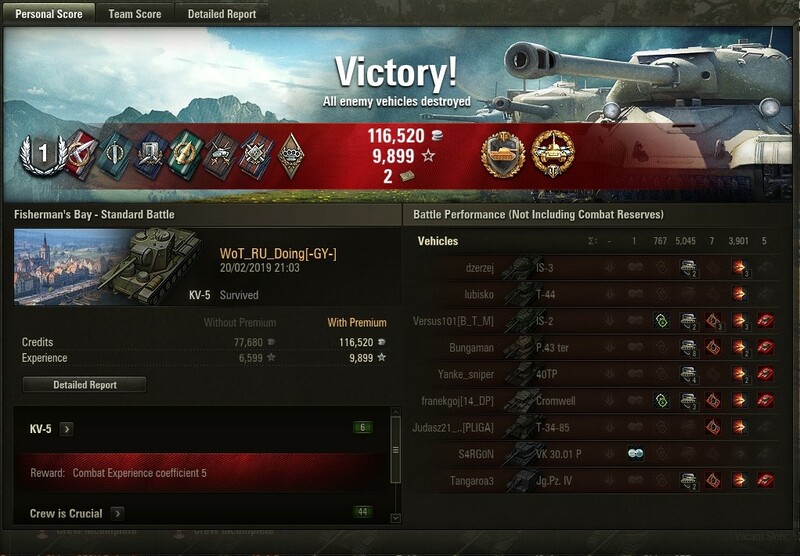 Meanwhile, it did rather nicely for me as a crew trainer, especially with the x3 crew XP event and the x5 XP missions. Edited by WoT_RU_Doing, 21 February 2019 - 01:07 PM. Ignore the Shill's posts, Do NOT buy this tank unless you are a die hard collector! The KV5 has been power creeped to death and the recent buff really did nothing for this tank either. KV5 was fun back in the day, but with the current *Edited matchmaker, maybe 1 in 10 games you will be top tier and have some fun. this tank has pref MM but remember it has to fight monstrosities like 252U, Skorp, 130pm, Type 4 (lol) Obj 430 to name a few that will make you come back to the forums and show us on the tank doll where they touched you. Edited by VyNKaSMyN, 22 February 2019 - 05:01 PM. This post has been edited by the moderation team due to imappropriate remarks. Sigh, yet another bundle. I don't want the crew, I don't want the gold, I don't want the missions. I just want the bloody tank. It would be expensive enough just by itself, being just a pixel tank.